Tom Baker wasn’t getting along with John Nathan Turner, who had just started his tenure as executive producer. His main problem was that Turner had proposed a change in wardrobe. Turner wasn’t worried; now he could take the show in a whole new direction for a modern audience. The 80’s were underway. 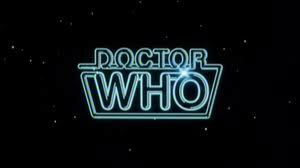 Peter Davison is the first Doctor since Troughton to only have one opening. It’s basically the same as Tom Baker’s final season. The show now aired twice a week rather than once. In “The Visitation”, the Sonic Screwdriver was destroyed. Turner thought it had become a crutch. 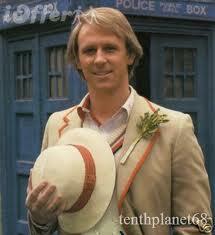 Peter Davison was born Peter Moffett on April 13, 1951 in Streatham, London. He started acting as a member of the Byfleet Players, an amateur company. He studied at the Central School of Speech and Drama. His first job as an actor was stage manager at the Nottingham Playhouse. It was here that he adopted his stage name so as not to be confused with director Peter Moffatt. In 1975, he got his first TV gig in an episode of The Tomorrow People. It was in 1978 that he got his most famous role outside of Doctor Who, Tristan in All Creatures Great and Small. He also played in the TV version of Hitchhiker’s Guide to the Galaxy. Peter Davison was the youngest to play the role before Matt Smith. He was twenty-nine at the time. After his era concluded, Peter Davison returned to the role for charity and Big Finish. Post-Doctor Who he has appeared in programs such as A Very Peculiar Practice and Magnum PI. I like Peter Davison’s gentler approach to the Doctor. To me, it doesn’t seem as if he tried to outdo Tom Baker. My biggest problem with the Davison era is that the TARDIS seems crowded. For the first half, there’s too many companions and it seems as if the writers had trouble fleshing them out. The latter half seems much better. Adric is one of the most hated companions. But to me, he doesn’t deserve the “Wesley Crusher of Doctor Who” title. He’s not a Gary Stu, because the Doctor is still allowed to be competent. Wesley Crusher caused that a lot. Nyssa is my favorite companion from this era. She is pretty, kind, smart, and most of all, stoic. Here is someone who lost everything dear to her, but presses on. Tegan is one of my least favorite companions. She doesn’t seem as courageous as some of the others and I think she hinders the story. I also don’t like her voice. Vislor is a first for the show. He’s a companion who starts out working for the Black Guardian. I don’t really think he reformed; he was just saving his own skin. Kamellion is a great idea, but a bad execution. He was an actual android who could move and even mime speech. There’s just one problem: his inventor died after “The King’s Demons” and left no instructions for how to operate it. Peri was supposed to be American, but you’d never know it from her voice. Her most memorable moment in this era is out-shouting the Master in her first story. I’ll talk more about her next time. This is the final story in the trilogy that introduces Anthony Ainley as the Master. It’s a bit on the surreal side, but has some great moments. Black Orchid is a solid period piece and mystery. In my opinion, it’s one of the few good two-parters and makes good use of its time. This is Adric’s best story from this era and unfortunately his last. His final moments are well-acted. Omega returns to steal the Doctor’s life force. This features some great moments for Nyssa, and is one of her best stories. We also see an excellent performance from Colin Baker, who we’ll talk about next time. This story brings back one of my favorite villains, The Black Guardian. It’s well-paced and a unique trilogy. Mawdryn brings back the Brigadier (the original idea was to bring back Ian Chesterton, but William Russel was unavailable). Terminus is one the best departure episodes. This is my favorite multi-doctor epic. It’s great to see all the characters again and it’s just all-out fun. Richard Hudnall does a great job as the First Doctor. It’s a must for any true Whovian. Christopher Bidmead is a writer who was brought in by Turner during Tom Baker’s era. This is by far his best story for the show. He’s the one who came up with the “brainy specs” so watch for them! The Daleks make their obligatory appearance and there’s lots of action in this story. It’s one of my favorite Dalek stories. Robert Holmes is back for an excellent story (I promise this is the last time I fawn over him). This has a solid villain (thanks to Christopher Gable’s superb acting) and features some great acting from Peter Davison. He truly went out with a bang. This story is so s l o w. It’s just boring. And what’s worse, the Doctor goes full deus ex machina. This story is just a mess. The Master feels out of place in a story that doesn’t really play to Ainley’s strengths. The BBC’s classic Doctor Who site says that the Master really does his best when his plans are on a grand scale, and I totally agree. Why would the Master care if the Magna Carta isn’t signed? Why is he in this story? That’s just the start of my problems. My biggest problem, though, is that the story is very rushed.